Teaching the Beatles is designed to provide ideas for instructors who teach the music of the Beatles. Experienced contributors describe varied approaches to effectively convey the group’s characteristics and lasting importance. Some of these include: treating the Beatles’ lyrics as poetry; their influence on the world of art, film, fashion and spirituality; the group’s impact on post-war Britain; political aspects of the Fab Four; Lennon and McCartney’s songwriting and musical innovations; the band’s use of recording technology; business aspects of the Beatles’ career; and insights into teaching the Beatles in an online format. Teaching the Beatles to Undergraduates is a thoroughgoing study of contemporary approaches to post-secondary courses devoted to the Act You’ve Known for All These Years. 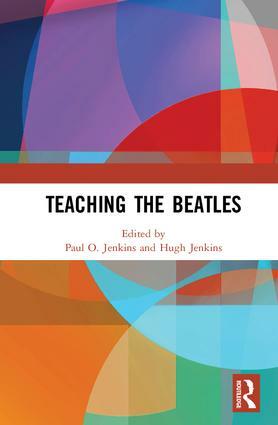 With chapters related to music theory, ethnomusicology, the social sciences, librarianship, business, and literary scholarship, Teaching the Beatles to Undergraduates offers a vital window into the wide-ranging possibilities of a Beatles-centric pedagogy. With its dual accents upon learning outcomes and Fab Four wisdom alike, Teaching the Beatles to Undergraduates is the kind of book that readers will find themselves coming back to - whether they’re preparing their next syllabus or simply in need of another fascinating anecdote about those four lads from Liverpool. Hugh Jenkins is a Professor of English at Union College in Schenectady, New York. He is the author of Feigned Commonwealths, a study of the country-house poem, and numerous articles on John Milton. A lifelong Beatles fan, he regularly teaches a course on the group at Union. Paul O. Jenkins is the University Librarian at Franklin Pierce University in Rindge, New Hampshire. He is the author of Richard Dyer-Bennet: The Last Minstrel, as well as numerous articles about folk music and librarianship. He has loved the Beatles ever since his father bought him Rubber Soul in 1965.